When I was in my very early 20's, I would write on my mirrors with dry-erase markers. I loved leaving messages for friends, or show song pride by scrawling a lyric over my reflection! Now, in my later 20's, I think I've found something even better: Idea Paint! I learned of this amazingly innovative paint through BzzAgent. 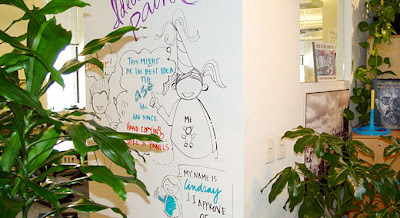 Idea Paint allows you to turn any paint-able surface into a great big white board! Think of the possibilities ... 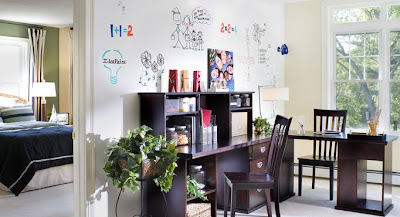 Kids can draw on the walls in their play room, foodies can detail recipes above their stoves, "to-do" lists can adorn doors, you can even paint your coffee table and write out your own TV Guide! Where would you slather a few layers of Idea Paint? What?!?! This is amazing! Must find out where I can buy this! Tanya, I love the way chalkboards look, but I can't stand the feel of chalk itself! Brilliant! When chalkboard paint came out, I kept putting off using it because I am not a huge fan of the way chalk writes. But this is right up my alley. Love It! Awesome! My dad built me and my brother a fort when we were young and we would have LOVED having it painted with this! this is awesome! will have to remember that for my future house!